You’re looking forward to another season packed with racing, right? But actually watching it can be problematic. Often a race may be on TV somewhere but there’s no way to watch it from your home or work so you resort to a dreaded pirate stream, complete with whack-a-mole pops ups and more viruses than a kindergarten. There’s a better way: Kodi. Or at least this technology is promising but there seem to be frustrations along the way. Here’s an introductory explainer and it’d be great to hear feedback from any users in the comments. It’s open-source media player software that plays and streams audio and video content. It grew out of the XBox Media Center, XMBC, and in 2014 the software was renamed Kodi. It’s not much different from the likes of VLC Player but we’ll get to the software difference in a moment. You may think the hardware is different, that Kodi comes in a box or stick much like Apple TV, Amazon’s Firestick or Google’s Chromecast. It can be bought and this way and you can set up a Kodi box, plug it into your TV and then watch streamed video content this way. But, and here’s the important part, you can also download Kodi to your Windows computer or Apple Mac too and then run it on your home computer or laptop to watch racing within a window without having to buy any hardware. What sets Kodi as software apart is the availability of “add-ons” where users can download and install these third-party scripts to use with Kodi. 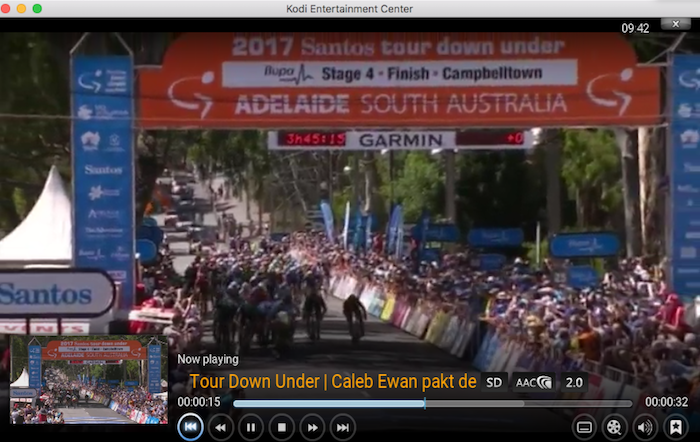 For example I downloaded an Australian TV add-on and watched the Tour Down Under coverage on Channel 9 via Kodi. There was a good, free and official livestream on Channel 9’s website but the picture quality on Kodi was way better and the images about 20 seconds ahead of the stream too, handy if you watch a race with simultaneous social media. Can I Watch Every Race For Free on Kodi? Probably not. For example you can get an add-on for Australia’s Channel 7 if you want to watch the Cadel Evans road races this weekend but it’s geo-restricted. The same if you want, say, Italy’s RAI TV channels so if you’re outside Italy you can’t watch, say, Tirreno-Adriatico this way. However there’s a but so big Sir Mixalot would rap about it because there are also add-ons for pirate streams too and there are also peer-to-peer add-ons that allow people to watch sports and other content online for free. Indeed the exponential growth in Kodi use seems to be driven by people using Kodi to watch Premiership football, NBA basketball and other premium sports. This is far from ideal whether in principle or practice but if you’re already resorting to pirate streams to watch bike races, perhaps because there’s simply no other way to watch a race in your home country, then Kodi seems superior because the video quality is much better and you don’t get those pop-up ads forcing you to play whack-a-mole while trying to watch a spring classic. However be careful downloading random things from the internet. Interested? Then you can buy a Kodi box for streaming or you can just download it onto your computer and then install it as you would with any other piece of software. In order to get content you need add-ons and this is where things start to get complicated. Obviously there are many add-ons serving sports fans but few if nothing for cycling fans, instead you need to look up the likely channels and then the installation process is more complicated than one or two clicks, it involves copying URLs and rooting back and forth around in Kodi’s settings but there are plenty of only guides to walk you through this process and once you’ve done it a few times you’ll get the hang of it. This is probably the most painful part but it’s still little more than clicking a few times and some copy-paste work; Kodi maybe open source but users don’t have to tweak a single line of code. It would be something if you could open the software, search for your preferred channel and sit back. With Kodi this is technically possible but it’s not there yet in reality. As such this is more evolution than revolution, a story of additional choice. Currently finding content, even legitimate streams, is not plain sailing. You have to find an add-on, work out how to install it, and then see if it works because plenty don’t. This means it’s as much an exercise in fishing as it is in streaming. You can watch legitimate streams in a clean format on your device and if inclined you can find those pirate streams too, only in higher quality and without those suspicious pop-ups. The fundamental frustration of many bike races being televised but not being available to watch in your home country remains. Kodi can help but it won’t fix this. Could be very useful – thanks – although I dread the thought of my techno-goober brain actually having to use it. For pirate streams, use an adblocker and they’re fine (aside from the quality). Yes, I agree it could be an option in an emergency. I don’t like the idea of downloading ‘add-ons’ though. Incidentally, I find that watching on the laptop a la corsair, if you click in to the full picture, the whack-a-moles etc do not affect the picture (even if you have no adblocker). The best quality pirate streams I found last season were run through youtube. I had similar experiences last year. Both for maximizing the window and with YouTube. Kodi is great! Yes add-ons can be tricky to get installed and working but like you say worth a bit of effort. There are ways around “geo-locking” within Kodi as well but knowing what feeds or online channels to target could be very useful! I used the android app Modbro to catch the daily ITV highlights of last years Tour de France whilst on holiday in Australia. Worked ok and quality was ok on a tablet. I belive this is the way forward and may be the begining of the end of the CATV…unless the they start introducing some sort of solution. For instance, Netflix and NBA TV apps are good examples of how things would look in the near future. Kodi needs improvements, but the mass pressure to seek for an alternative will eventually suceed…like a stream of water running thru the way of less resistance to meet the ocean. Here is a question for you knowledgable people, bypassing geo restrictions, in particular to fool the Sporza website/ app I am in Belgium would be great. Has anyone done this and if so a layman s guide would be great, pointing me in the direction of an iPad app that would do this would be even better, I don’t mind spending a few quid on it. Of course google brings up various berwildering options, but I’d much rather a recommendation rather than risk downloading random stuff. Tunnelbear does not have server locations in Belgium so doubt watching Sporza will work. I’ll second the Tunnel Bear recommendation. Super easy to use once it is set up, great support when you pay (there is a free option) and really cute as well. Try it, and you will see what I mean by cute. FoxProxy works great if you want Sporza. I’ve used a Belgian proxy from the for the last few seasons so I can stream Sporza in the US. Mr Inrng – thank you for most of the articles you provide. For many this will just serve as a way to not sign up for channels such as Eurosport, Sky, NBC Sports Gold, BeinSports or sling, fubo.tv. I don’t pretend to know the details for every country… but if you are truly a cycling you should sign and PAY for the appropriate channels that you can. I realize that some of you will rationalize that this stealing is ok…. if you were a performer, an artist, a programmer, an athlete – you wouldn’t feel so good about it. Likewise if you owned a store, how would you feel if people shoplifted ? I just repeat again pay for all the legitimate sources in your country first. The Cabling bundling in the US – is targeted at Sports fans, with multiple sources for races, and many missing. This makes the case why a unified management of the media cycling rights (ala NBA), would be superior to the ASO exclusionary approach. And in some places, many bicycling races aren’t broadcast, if at all. We follow certain popular TV shows. They aren’t broadcast or distributed here by any mean – cable, over the air, (legitimate) online streaming. Others are delayed or not broadcast in original language. Alternate markets pop up when traditional marketplace fails. This is a problem for the supplier to solve, not the moral police. I agree we should subscribe and pay where possible, often the cost is low and the quality and reliability is high, eg Eurosport Player. So far my experience with Kodi is a way to watch legitimate streams online, eg watching the free TDU stream last week was just better via Kodi and you can tap Sporza’s archives legitimately as well and feast for free on a five part Merckx documentary. But yes there’s the pirate side too and it seems many watch races via pirate streaming websites already for the reasons Jay says. for pirate streaming that horse has bolted, had a successful race career and been put out to stud. Anyone who wants to pirate-stream is already doing so and we all know which cycling sites to visit to find them, so I don’t see inrng as promoting or enabling it, just accepting it happens and discussing it. I guess I’m in the “all the legitimate sources in your country first” camp, as I pay for eurosportplayer – it covers more road races and usually in full compared to the UK terrestrial ITV channel that shows the grand tours, often only in highlights. However I’m a huge fan of cyclocross and only some of the races are legitimately available anywhere in the UK, for the rest I either have to pirate-stream, or wait for someone to upload it to YouTube (which is effectively the same thing). It may be far more complex than I’m giving it credit for but it seems shortsighted for broadcasters and promoters to geo-restrict when there is no local competition or alternative (and kudos to Trek in the US for arranging legit free streaming of some CX races there). Interesting timing for this conversation as Sky is dropping Discovery, who carry Eurosport. so there are lots of disgruntled Sky-subscribing cycling fans in the UK. FYI in the UK Eurosportplayer have a promo on and an annual subscription is only £20 rather than the usual £60 if you sign up before the end of the month (no connection to them other than being a consumer who’s re-signed up at that price). Kodi isn’t piracy or theft, as you only stream content and do not download. Due to technical reasons Eurosport Player has been suspended on the Connected TV, Xbox and Windows Phone. Eurosport Player is still available on PC/Mac and on mobile devices for Android and iOS. It seems true cycling fans (in the UK at least) have PCs/Macs/mobile devices and/or subscriptions to Sky*/Virgin channels they never watch. *It’s mentioned in these comments but any true cycling fans out there thinking of subscribing to Eurosport on Sky keep an eye on the news. My first cycling season without a sky box to record Eurosport, rarely get the chance to watch live. I subscribe to Eurosport and it works very well, at least most of the time. This is the real solution, to have a proper HD video that’s only limited by your connection speed with audio you can understand… but even so not every race is on Eurosport so you can still hunt online for some races. UK Bike Channel really needs some sort of online offering as it plugs some of the gaps that Eurosport misses. The UCI event streaming is pretty bad on Youtube too. I’m never sure whether it’s YT or the source – I suspect the limiting factor is usually the uplink from the remote location to “the internet”. So correct me if i’m wrong, but Kodi is basically a player through which you run pirate streams? Albeit at better quality because it’s pirated direct. It’s an interesting idea, although given how much cycling is available free-to-air in host countries to my mind a VPN can easily get you around geo-restrictions and then into the direct feed. Depending on the race and the host channel, but most people are pretty good at online streaming their channels. Especially for the bigger WT and PCT races, they are covered by the bigger broadcasters and often available in multiple places. With enough coverage i can see Kodi becoming a good platform for streaming through. Think i’ll hold off trying it myself until the structure is more in place and polished. That and so much of bike racing is rather dull, catching the action via highlights packages on Youtube is a perfectly good option that suits me fine. It’s a player and you can watch pirate streams but you can watch legitimate ones too. As you say with a VPN you can find these channels, with Kodi you could curate a list of channels so you can watch all the video via Kodi rather than your browser, not much difference but as I saw with the TDU the video was much a better quality. Not really. The average person is much better off with finding a flash-encoded stream and aggressive ad blocking with their browser. Where Kodi is ready to do NOW is to serve IP television streams. For example, there’s a plugin for the European Space Agency. Any content they stream can be recorded and viewed from within Kodi as if it were more netflix content instead of a clunky web browser. Imagine this x100 and in other formats/forms. This is the future. Given the IOC *JUST* launched a pay tv channel in 2016. They are about 25 years too late and generally view the Internet as one big piracy problem. So, I very much doubt the UCI/ASO will embrace the potential of Kodi. Meh. I’ll stick to downloading an HD torrent later in the day. I know what I’m getting and I can watch it at my leisure. Pausing as I please. Who has hours in their day to sit and watch a full, live, race?! Hugs and Kisses, Vitus you POS. I know! I was reading these responses and trying to sort out how it is possible to watch a full bike race… haha. Try Roubaix 2016, for example. (I’ve known a couple of persons who tried to watch the HD torrent with a finger on the fast forward button and ended up without pressing it once). But there are some other three or four good examples out there in 2016 season only – if with *full bike race* you mean *full race*. Whilst, if you just mean a *full broadcast*, that is a couple of hour, I’d say that the vast majority of the Giro’s stages serves well for that purpose, as well as most races, to say the truth, especially Classics. All that assuming that you’re the kind of fan who only sees the most apparent part of the action, because there’s a lot to be seen even when most viewers aren’t seeing anything relevant – which would extend even further the possibility of watching “a full bike race”. That said, I guess that if one’s mainly watching, say, the TdF and the Ardennes, not only full watching is akin to punishment but anything more than a stats page with the results and, dunno, some photos, might be close to being already too much. I meant I really wish I had the time to sit down and watch a full race, but family won’t let me sit down long enough to see the entire thing! +1 The ONLY thing better than a live broadcast is being there yourself! I don’t mean you have to plant yourself in front of the screen with a flask to pee in so you don’t miss one second and I do understand that too many English commentators prattle-on annoyingly with inane comments, but watching the whole thing (or at least as much as they broadcast) builds a suspense that simply can’t be matched by highlights or replays. I’ve even watched with 5-6 year old kids, who (once bike racing was explained to them in an understandable way) started to get interested in the show! One completely legal cycling channel in Kodi is just using the Youtube addon to get the UCI live feeds. Was watching the CX from Hoogerheide on this at the weekend, it covers a fair bit of track racing too. Only problem with the interface is, it caches the search results and the ‘Live’ feeds don’t show up till the feed starts…so if you search too early you need to think of a creative way to find the same feed again with another search. There are 2 YT addons, one fro the official Kodi repository, another one called Youtube Chnnels https://www.tvaddons.ag/kodi-addons/show/plugin.video.ytchannels/ , which let you store the UCIchannel as favourite. More handy than the official one. Though the addon doesn’t help much if it’s geo-blocked in countries the UCI sold rights for a specific event. I can favourite YT channels in the ‘official’ kodi addon just fine (search for UCI, choose ‘Channels’, select the UCI channel, press c, add to favourites) – also I’m using Amber so favourites appear as their own section – the standard (in v16) Confluence skin is fairly useless as favourites are awkward to get at and it only lets the addon itself, not any other content inside a plugin like YT channels, appear as an icon in the home screen. This is a good way to surface other content too – I’ve got a pile of Sufferfest videos for the turbo, Kodi can’t scrape metadata for those as TV or Movies and the Video section buries them several menu items down. So, favourite that, use a skin that features favourites prominently, and they’re just a click away. The big problem with the YT plugin is the API keys keep being over quota – you need to get your own. Also, as you say, other channels come in and swipe races from the UCI. I guess I can live with that since it means the sport is getting more popular? Thanks for sharing this. I thought the digital age would have opened a world of watching whatever you wanted, whenever you wanted, but instead there are still too many geo restricted DVD’s, TV broadcasts, etc. We faced these frustrations when in the USA over too many winters. Even in Italy we bought the Eurosport package (though in Italy we got the Italian commentary, thank gawd!) to augment the free RAI coverage available. As much as I dislike Rupert Murdoch, we do miss the SKY setup we enjoyed free one winter (The Bike Channel is great) but didn’t really want to hand this plutocrat any of our money. Back in the USA we bought a current model, cheapo Dell laptop dedicated solely to TV streaming via HDMI cable and use a VPN to access RAI and Eurosport (our subscription works since it was set up in Italy and the VPN lets you pretend you’re there, even from here in the USA) and are able to watch pretty much anything these days. Since this laptop has nothing on it other than the OS, we don’t worry about any negative effects from the free VPN and any junk that shows up via pirate streams (if we can’t find it on Eurosport or RAI) is easy to remove without fear of losing any important data. One of our Italian faves is RAI’s RADIOCORSA show on Thursday evenings which they’re running even in the “off-season” when there’s not much in racing results to report. Instead you get more rumors, gossip and visits by guests who don’t have much else to do during this period. Has anyone else used the tiz-cycling.racing site? I prefer on demand so I can watch at a convenient time (PST). OMG, you threw in a Sir Mixalot reference!!!! Genius. +1 how was this not the lead comment topic? Also if you have a smart tv. I was thinking about getting the Eurosport Player app. Does anyone on here have it? Can you download race packages to your phone or is it live streaming only? I have it and like it, you can sign-up online and watch via your browser and then on the app via mobile. The quality is good and it works across countries, if you are in a country that has its local version of Eurosport then you get that rather than a “sorry this only works in one country” message which is handy if you travel. Also you get extra channels so that if a bike race isn’t on Eurosport 1 or 2 you might find it online, at least without the sound. I’ve seen tweets saying it is 20 pounds for the year which sounds like it’s hard to lose here but check your T&C in case they sting you with a pricey auto-renewal for the following year. Concious that this reads like a sales brochure but am just a satisfied customer. Thanks Inrng, it sounds like a worthwhile investment. Does it still work without internet connection? E.g. Netflix have just brought in the function to download to your device for when you’re on trains/planes etc. Sorry for the million questions – I realise you’re not Eurosport customer service! No, don’t think you can watch offline. With the browser you can go back, just move the time slider back an hour etc but it’s online only. Thanks for the reply Inrng. It’s a real crossroads for TV/sports industry now as to whether they can embrace change and offer more flexible subscription models or whether they stick to old school “bundles”. Get it wrong and pirate streams fill the gap, whether they like it or not. You can only go back 3 hours with the slider. And it’s Europe only, annoyingly. Checked the T&C for that offer. Seems okay – you just have to remember to cancel autorenew sometime in last month (you have to wait until then) or it puts you on the monthly plan. I’ve been thinking about signing up – will probably do it having read all this. The other handy thing about Kodi is that you can run it on a Raspberry Pi. Rather than having to put a PC out in the garage where the turbo is, I have a Pi running Kodi which allows me to stream (legitimately) Eurosport Player and a couple of other things to pass the time like Youtube, iPlayer etc. Pair it with a cheap monitor from Amazon and a wifi bridge to provide a strong connection and you have a pretty good (and cost effective) solution to entertaining yourself when the weather is simply too grim for a ride. Zattoo, the Swiss version, is an excellent option. It has a myriad of domestic and international channels, including Eurosport, ITV, BBC, ARD, ZDF and RAI. Works across different platforms. You would need a VPN or DNS service to access it outside Switzerland. I am a mythtv user from way back. Very worth it IMO. It’s not the same thing as Kodi and the backend needed to record runs only on Linux. It’s a great way to free legal content from a set top box for time shifting. Also, there are a very large number of Android IP TV devices on amazon that are essentially Kodi front ends. A few include a Kodi build. What I find ridiculous is the fact that I have to pay over £145 for a television licence here in the UK, but there’s virtually no cycling all. Plenty of ball room dancing, cake baking and what have you. If Eurosport is so cheap, why can’t the Beeb do a deal and get it on terrestrial television? Previous post: Pro Team Sponsors: What Do They Do?